After a few days of roughing it in the woods to escape the Easter weekend vacation crowds, we were seriously ready for a shower and clean laundry. A friend had recommended the small west-central highland city of Uruapan (oo-roo-WAH-pun), so we decided to alight here for a couple of days. It was a relatively comfortable place, surrounded by avocado groves, with a noticeably youthful population due to several universities. We enjoyed some pretty decent live music in one of the bars – a trio of acoustic guitar, electric bass, and percussion, playing a variety of Latin folk songs, including several works by the famous Cuban musicians Silvio Rodriguez (one of Carley’s favorites) and Pablo Milenéz. The bar also featured some interesting cocktails which we’d never seen before; our favorite was the one with tequila, pineapple juice & grapefruit soda. 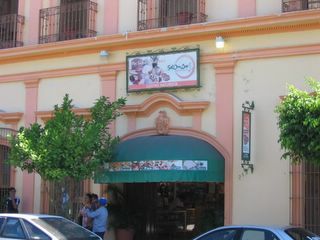 However, Carley’s favorite treat in Uruapan was undoubtedly her dinner the second night, an aguacate relleno, which consisted of two halves of an avocado filled with Mexican shrimp cocktail (baby shrimp in a mild tomato-based sauce). Uruapan also boasts its own national park right next to the city center, which was constructed to resemble a tropical jungle, complete with a number of waterfalls. However we decided not to pay the admission price, opting to wait for the real thing in our upcoming travels. 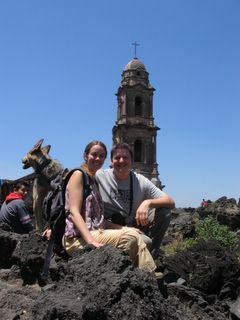 Ultimately, the high prices and noisy traffic jams of Uruapan made us happy to be on the road a few days later. Our next adventure took us to the site of one of the world’s newest volcanoes, the famous Paricutín. This little fire-breathing mountain first burst onto the scene only around 60 years ago, right in the middle of a farmer’s field. According to the story, the farmer was plowing his field when the sparks and ash first started spurting from the ground, and he tried to cover it with dirt before finally giving up and fleeing. 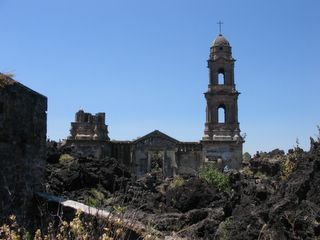 Eventually the lava completely covered 2 small towns, leaving only the top of one tall cathedral, Templo San Juan, poking up through the surface. (Apparently nobody died, since the lava moved very slowly) Today the remains of the cathedral still stand, and this was our destination. 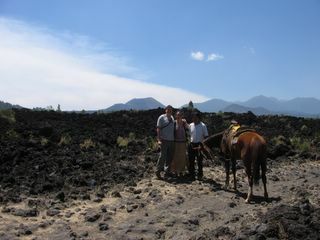 When we reached the village nearest the volcano, we were immediately surrounded by local guides with horses offering to take us to the volcano for a price. We refused, pointing out our dog who was simultaneously barking at and trying to hide from the horses. 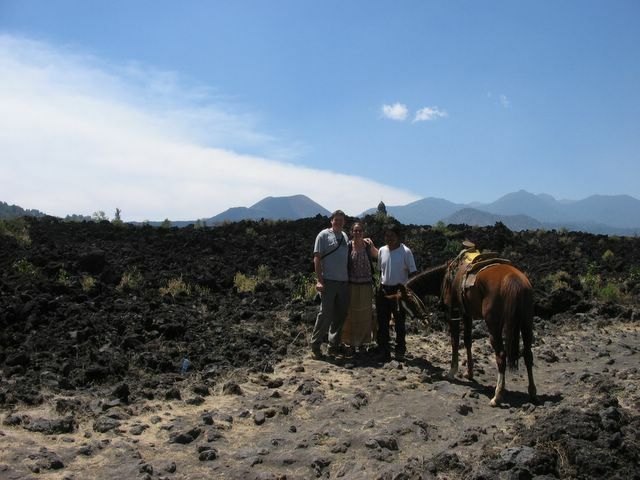 But one of the guides stuck with us anyway – Miguel. And, of course, we ended up paying for his services since he was very nice, informative, and we learned during the hike that his wife was expecting twins. He was a local Purépechan who had learned some Spanish in school and picked up the rest by talking with tourists. 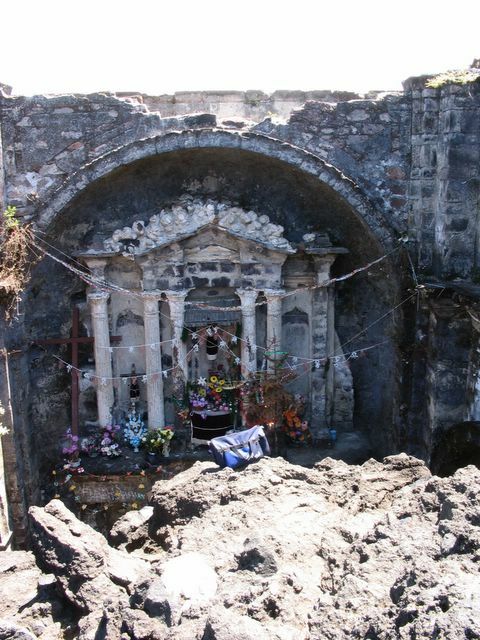 He told us that the two villages destroyed by the volcano were resettled, but as a result, neither village has maintained much of their indigenous language or culture. In his village, Angahuan, most people still speak the indigenous language (few speak Spanish), dress in traditional indigenous fashion (the bright skirts of the women were particularly striking), and maintain at least some of their pre-conquest religion (though they identify as Christian, they still worship old gods, especially the Rain God, which is easy to understand in light of all of the dust). After a 2-mile hike from the village, first down a road of black ash, then across jagged black boulders, we were able to climb on parts of the church and even enter some of the rooms. In 1943, as the volcano continued to grow and spew lava and ash, the local people became convinced it was the end of the world and gathered in the church to await the rapture. 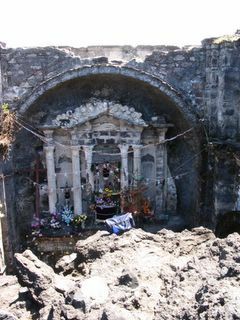 Miguel showed us black & white photos of these townspeople gathered in the church with lava on either side of the building. Eventually the Army was called in to forcibly remove them. As things turned out, the altar of the church remained intact, leading many locals to call it a miracle…and it did seem a bit miraculous, since a high wall of lava rock had stopped abruptly only a few feet from the altar. The volcano itself was still several miles away and quite small compared to the other mountains in the distance, due to its having only erupted once in its life so far. Rob was really hoping to hike all the way to the crater itself, which still emits wisps of steam; however he changed his mind once he learned it would be at least an 8-hour walk with puffs of black ash rising from every footstep. 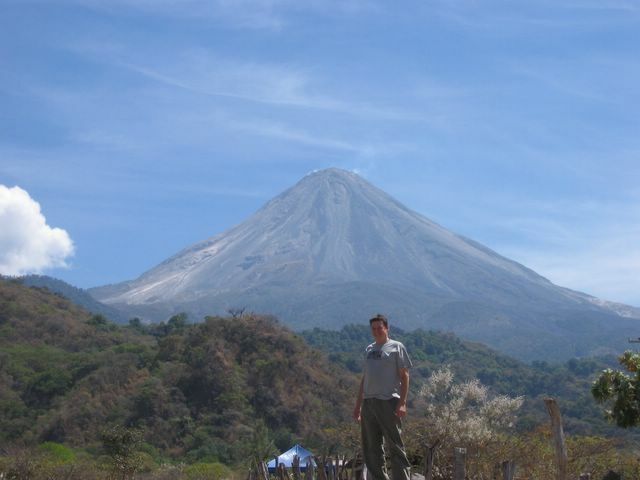 After a 4-hour drive west, we arrived at the base of a couple of huge volcanoes, the twin peaks of Volcán de Fuego (fire) and Volcán de Nevado (snowy), about half an hour north of the city of Colima. Although Nevado didn’t actually have a snowcap in late March, Fuego is very aptly named since it seems to erupt every few years, forcing local villages to evacuate rather frequently. 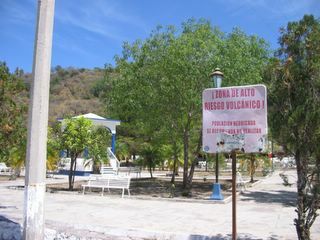 We visited the village closest to the base of the volcano, Yerbabuena, and it was practically a ghost town. Besides one local resident, the only people we saw were army soldiers who were there to prevent people from going any closer to the volcano, and probably there to make sure people evacuated in case of emergency. From this vantage it was easy to see steam rising from the massive peak. We spent the night at a nearby campground next to a lake, but got very little sleep due to the noisy goose population and the free-roaming horses grazing near our tent. 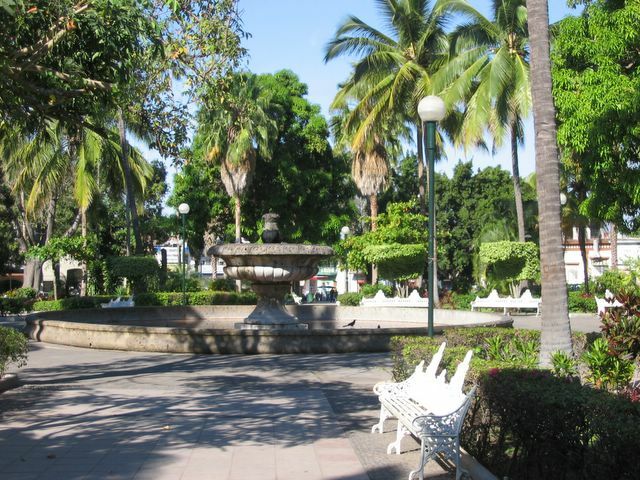 The next day we checked out the nearby west-central city of Colima, a small, beautiful city with lush green plazas and a rather up-scale sophisticated vibe. Here we decided to spend a night to get rested and ready for our upcoming long drive down the coast. We ended up eating all of our meals at the same restaurant a block from our hotel, the veggie-friendly Centro de Nutricion Lakshmi. 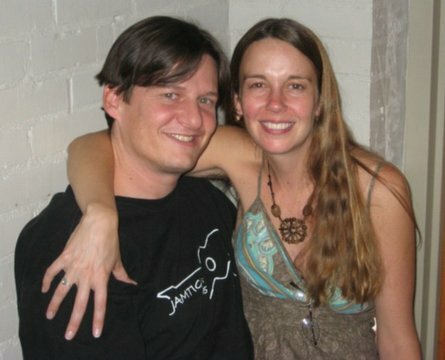 Although Rob is quite the omnivore and has no problem devouring most flavors of meat, he’s not opposed to a break here and there from the usual Mexican food. Besides, how could we go wrong with their broad selection of veggie sandwiches and soy-burgers and a buy-two-and-get-one-free Wednesday night special. (We are on a budget, y’know) And the breakfast the next morning was absolutely scrumptious: a huge plate full of fresh sliced fruit, covered with fruit-flavored yogurt, granola and honey – definitely a nice change from the usual eggs, beans & tortillas. After that we were ready to go hit the beach! !